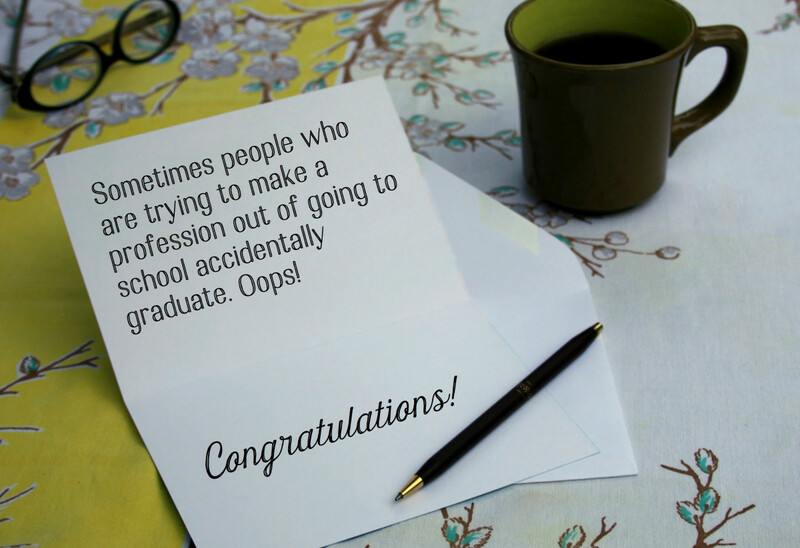 Ideas for what to write in a card to the new graduate in your life. 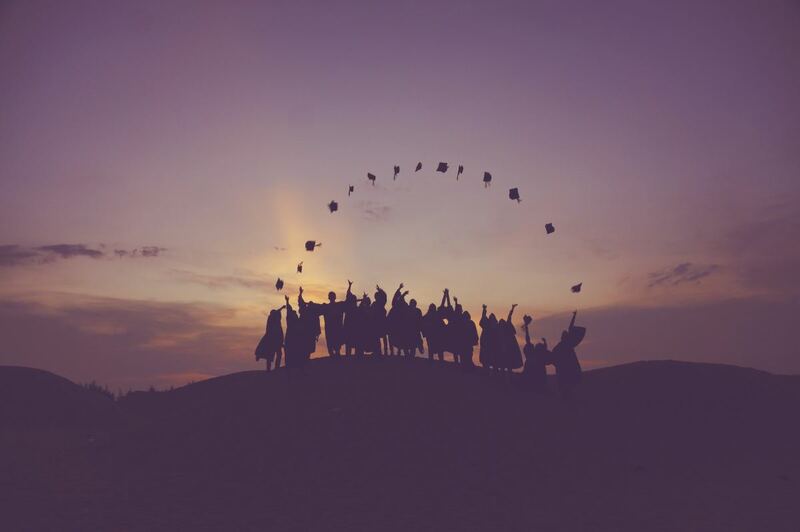 Graduation is a momentous event that deserves a congratulatory message that fits the occasion, but these messages can be difficult to write—especially what comes after the "congratulations" part. It's likely that the graduate will go through his or her cards very quickly, throwing away the majority of the cards immediately after removing the money enclosed. This may put your mind at ease some. 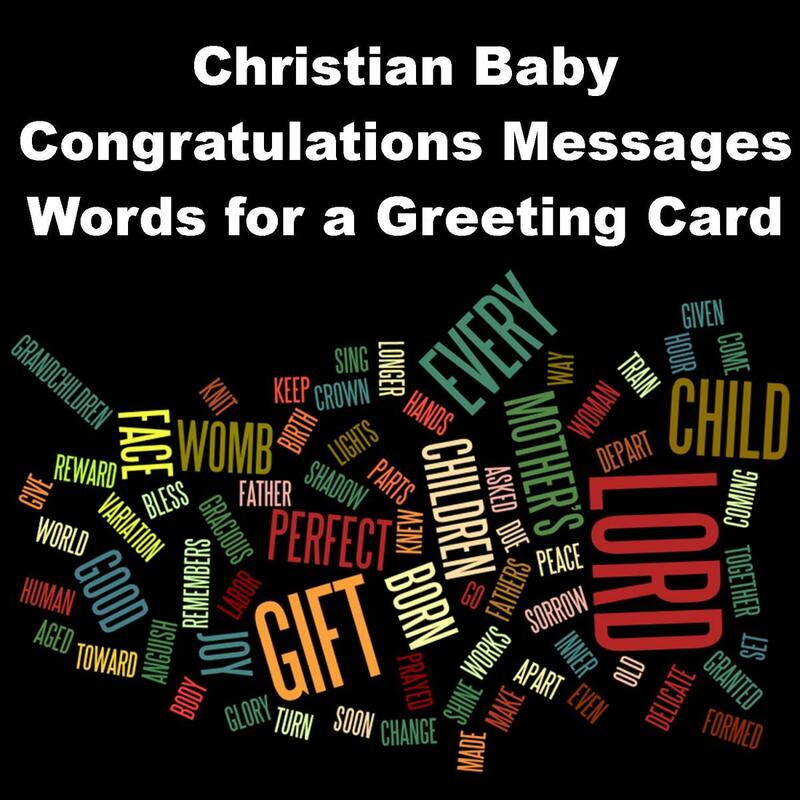 Use the examples below to help you figure out exactly what to write in your card. Change the message examples to fit you and the graduate, and have some fun with it. Graduation is a fun time, so your message should be, too (but if you prefer writing a reflective saying, you will find those, also). These will work as high school or college graduation wishes. Congratulations graduate! We wish you the best of luck in the future. You did it! Now it's all over. Or it's all beginning, depending on how you look at it. You get a piece of paper, but it means so much more than that. I hope you feel proud of your accomplishments. All your hard work is done, you have graduated. 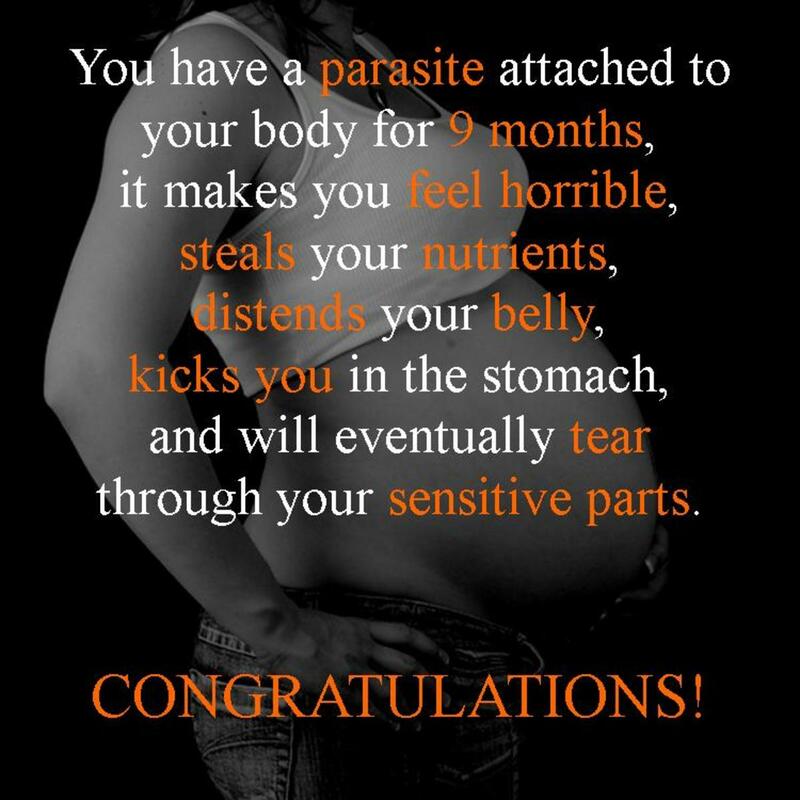 Well, maybe all your hard work isn't over just yet. Congratulations and good luck! Education is the key to unlocking your potential. The diploma helps a little, too. Your graduation proves all of your hard work and determination. I hope you continue to be blessed as your abilities continue to grow. You did it: now it's time to celebrate! I wish you many more successes in the future. Congratulations, graduate! You have not only graduated from high school, you have graduated into adulthood. Wishing you the best things in your future to come. Today proves something we have always known about you: you're pretty smart. I am wishing you a great sense of accomplishment as you celebrate your hard work. Continue to learn as a life learner, and you'll graduate life successfully. Don't worry! I'm still smarter than you, and you will still get advice from me all the time. Graduation day is the happiest day for a student. It's also the scariest day. I guess I have to stop calling you an idiot now that you've graduated. Don't worry though. I'm smart enough to come up with plenty of other names to call you. Sometimes people who are trying to make a profession out of going to school accidentally graduate. Oops! I had a nightmare last night. I graduated with your major and had to try to get a job. Miracles do happen! You have proven that anything is possible, even if it doesn't seem very likely. Isn't it amazing how far people can go now that Google and Wikipedia are around to help you with your studies? I'm not going to congratulate you because I know the harsh reality that comes after graduation. I offer my sympathy instead. You did it! You finally graduated. It's about time. Now that you've graduated, maybe you're smart enough to figure out how to pay back your student loans. If you thought school was tough, you're right, it's all a piece of cake from here. I am sure you feel much smarter now that you have graduated. Just last week you weren't a graduate, so you must have gotten much smarter. Congratulations on getting your degree. Maybe you will make enough now to pay back your student loans before you die. You get to wear a funny hat. All your hard work has paid off, and the hat is yours. Congratulations. Just think: now you get to add some initials after your name. Write me a 50-page essay analyzing the value of a diploma versus the value of a good education. That's your first assignment as a graduate. I don't know about you, but when I see diplomas, I start imagining dollar signs. Congratulations on getting all that money... I mean, your diploma. 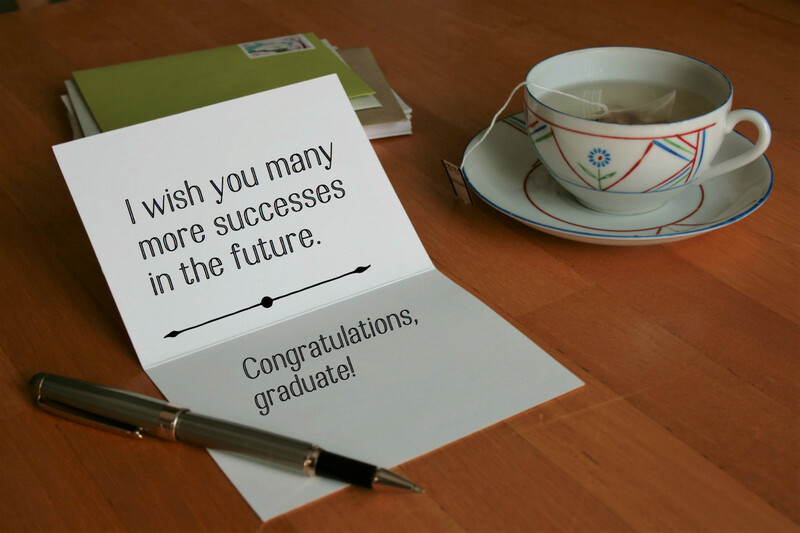 You will find many sayings you can use to write in a graduation card message, but the following are especially cool. Use these sayings to spice up your message in a simple yet meaningful way. 1. Stay positive. Give the graduate a feeling of hope, even if the job outlook isn't so hot. Don't rain on the parade. 2. Be concise. After opening the 30th graduation card, it will be likely that the over-educated graduate will be skimming the messages and plucking out the money and gift cards. Make a point quickly, unless you have something extremely clever or heartfelt to say. 3. Be original. 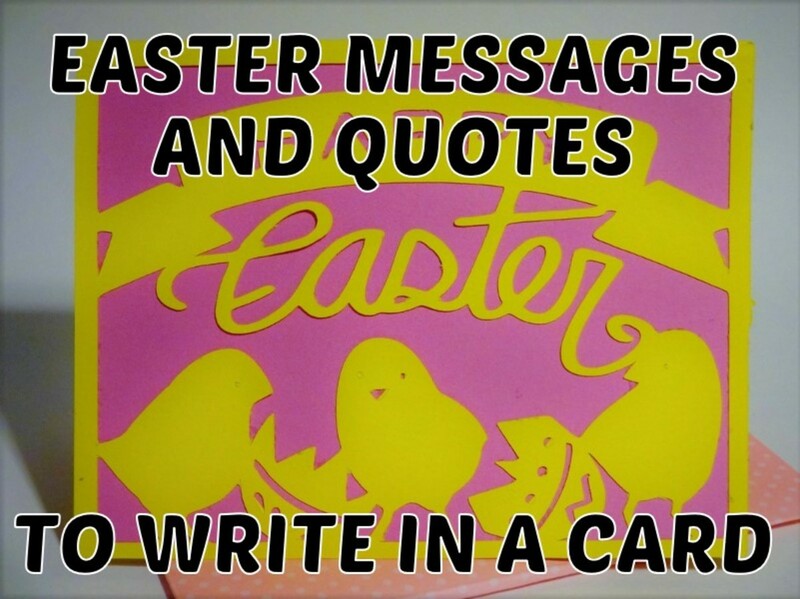 This is a general rule of thumb for any greeting card messages. Unfortunately, you are reading this because your originality needs a jumpstart. Never mind, just copy something from the internet. 4. Be careful with the jokes. For example, if you are going to make some joke about how much money it costs to go through school, it's a good idea to put a few bucks in the card. This will make the joke a lot more fun. 5. Include a piece of advice. If you can think of something helpful, a little advice goes a long way. If you need a little inspiration, watch the video below. 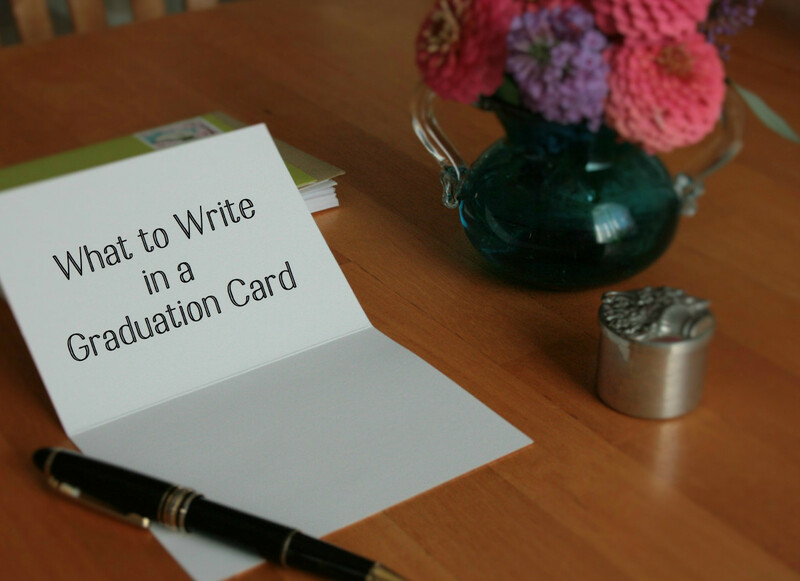 How many graduation cards do you write per year? More and more cards should be disbursed so as to encourage all the students. I appreciate all of you stopping by to use this page of graduation messages. If you need any further help, just let me know. This page could always be improved, so let me know if I need to add anything to it. Also, if you find that the wishes are just a little too generic, I'll be happy to help you come up with something more specific to write in your card. Make sure you leave me some specific details here in the comments, and I'll get back with you with some ideas! This site is so nice,it gave me an idea of what to write on my niece' graduation card. If you want to write one of my examples in a card, feel free to do so with a pen. If you are thinking of printing out this page, I suggest bookmarking the page to come back later. I may have updated it with even more great graduation messages and quotes the next time you visit the page. I love your quotes. How do I make a copy of them? yes, just what I needed to get my head around some words to say to a friends daughter graduating from law school! Thanks! You inspired this simple message for my nephew's graduation card. I was so impress! Thanks for this hub! Great Hub, looks like you've covered all the angles here! I am glad that google likes my hub. I tend to click the HP results first if I see on on the first page. Thanks! I found what I needed. Also rated up! 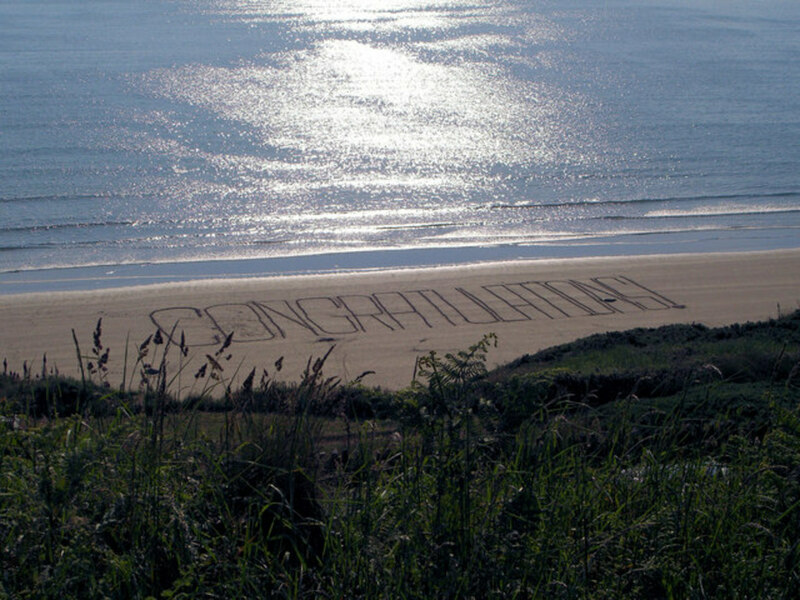 Haha,Very nice post,very informative site with nice message. As much as I love writing I find myself always speechless when facing the task of writing a card! Thank you Blake, very much, for this much needed hub! Time to start thinking about this-- good suggestions.